Almost 30,000 potholes have been fixed in Surrey at a rate of nearly one a minute in the first four months of the year. 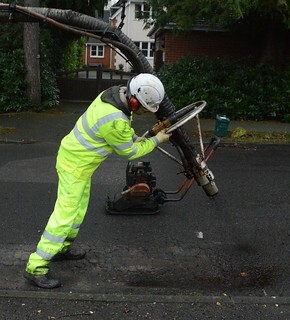 With the help of two hi-tech Jetpatcher machines, 29,980 potholes and other defects were fixed by the end of April. That works out to a rate of almost 50 an hour*. The repairs drive has been running alongside the council’s Operation Horizon programme to create more than 300 miles of pothole-proof roads. Cabinet Member for Highways John Furey said: “Every winter our roads take a battering from the elements and this new technology has helped us do more to mend the damage. “Prevention is better than cure, though, and our Operation Horizon project is all about rebuilding hundreds of miles of roads that also come with a 10-year guarantee to improve journeys and help companies do business. Potholes and other highways faults can be easily reported by visiting the council’s website or by ringing the contact centre’s direct number for roads and transport – 0300 200 1003. * If crews worked eight hours a day in a five-day working week.